This article originally appeared in Logos. Festschrift fur Luise Abramowski, ed. H.C. Brennecke, E.L. Gramsuck, and C. Markschies (= Beiheft, ZNTW 67). Berlin/New York: Walter de Gruyter & Co., 1993Sebastian P. Brock is widely acknowledged as the foremost and most influential academic in the field of Syriac language today. Dr Brock is a former Reader in Syriac Studies at the University of Oxford’s Oriental Institute and a Professorial Fellow at Wolfson College. He is a Fellow of the British Academy. Dr Brock completed his BA degree at the University of Cambridge, and a DPhil at the University of Oxford. He has been a prolific authour in the field of Syriac studies and his numerous publications are widely available. Sebastian P. Brock is widely acknowledged as the foremost and most influential academic in the field of Syriac language today. Dr Brock is a former Reader in Syriac Studies at the University of Oxford’s Oriental Institute and a Professorial Fellow at Wolfson College. He is a Fellow of the British Academy. Dr Brock completed his BA degree at the University of Cambridge, and a DPhil at the University of Oxford. He has been a prolific authour in the field of Syriac studies and his numerous publications are widely available. “Hmayrā” in the literal sense occurs a number of times in surviving Syriac literature. Aphrahat speaks of Hezekiah’s children being “led off as hostages to the King of Babylon” (sic)18; likewise Daniel “was led off as a hostage on behalf of his people”.19 Elsewhere, referring to events in the fourth century AD, we hear of daughter of a king of Armenia held “in hostage” (ba-hmayrā) at some stronghold in Media who nevertheless managed to steal the corpse of the martyr Aqqebshma20, while the so-called “Julian Romance” mentions Roman hostages which the Persians took in the peace settlement of 363.21 Temporary hostages, taken from Edessan nobility by Kawad a hundred and forty years later, are mentioned in the Chronicle of Joshua the Stylite.22 A particularly instructive passage in the Chronicon ad annum 123423 tells how, at the end of the siege of Constantinople in 626, the Persians “sent to heraklios and made an accord and peace with him, and they gave him hostages to confirm the agreement that had taken place between them, the hostages being selected by the emporor from among the children and brothers of the Persians, among whom was also the son of Shahbaraz.” Here, remarkably, the normal pattern of Byzantine-Sasanian parity is evidently broken, and the hostages are selected by the receiving party. all the living were hidden in him. offer it up to me as the right ordering of love demands. No doubt it is writers like Narsai and Cyrus of Edessa who provide the more immediate background to the imagery of Christ has a hostage that we encounter in the hudra. But, as the occurrence of the theme in an archaic Syrian Orthodox baptismal ordo suggests, its roots go back a long way in Syriac tradition, and the usage can be found already in both Aphrahat and Ephrem in the fourth century. “Putting on the body” is of course a standard metaphor for the incarnation in early Syriac writers;40 what is important to recognise is the freedom and variety of terminology in connection with the metaphor of “putting on”: the Word (in Aphrahat’s language here, “the King”) may put on the body, the body of Adam, our body, humanity, or even Adam. It seems clear that Adam typology is rarely far away from the mind of these authors, and it is this close connection between Adam’s body as the hostage given by Death to Jesus the King (Ephrem) and Adam’s body which the Word puts on at the incarnation that provides the origins of the sort of language we encounter in the East Syrian hudra. 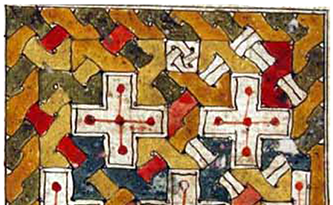 Early Syriac theological writing is characterised by a wealth of imagery, intended to point to the variety of the different aspects of the mystery of the incarnation. With the advent of the christolotical controversies, certain images became suspect in the eyes of one side of the theological divide and so were dropped by that party, and left to survive only in the writing of their opponents.50 Such was the fate of the imagery of the hostage, a notable feature of the fourth-century Syriac writers Aphrahat and Ephrem, but dropped by the subsequent West Syriac tradition.51 Even in the East Syrian tradition its survival is almost entirely confined to a verse or liturgical texts, being entirely absent from such writers as babai the Great; nor is this surprising, for prose writers by then were primarily concerened with the theological agenda and terminology that originated in the Greek tradition. It is a particular pleasure to offer this brief exploration of a distinctive metaphor belonging the East Syrian christological tradition to a scholar who has illuminated that tradition with such acumen, insight and distinction. In the printed editions of the East Syrian hudra “hmayrā” evidently occurs only in christological context; the following list provides all the passages which I have noticed. H denotes Darmo’s edition, and BC refers to the Chaldean form edited by Bedjan (for references, see notes 1 and 4. I have deliberately kept the translations rather literal). The first two passages feature on several occasions. 1…1 “and You united him with Your divine qnŌmā for the fulfilling of Your economy” BC. H I, 221 = BC I, 130 (2nd Sun. After Epiphany); H I, 227 = BC I, 134 (Mon. Epiphany week 2); H I, 492 (Tues. Epiphany week 7; BC different); H II, 120 (Sun. Entry of Fast; BC omits); H II, p. 372 (Sat. Fast week 5; BC different); H III, 578 = BC III, 404 (Mon. Consecration of Church, week 1); H III, 605 = BC III, 427 (Fri. Consecration of Church, week 3); H III, 620 = BC III, 439 (Thurs. Consecration, week 4). 1…1 “human nature, and united it with His qnŌmā, and He became” BC III, 116, 120. 2 “for His qnŌmā” BC I, 125. Consonant with this passage is the gloss “izgaddā” which is given to ” hmayrā” in Bar ‘Ali’s Lexicon (see R. Payne Smith, Thesaurus Syriacus I, col. 1020). H I, 215 = BC I, 125 (Tues. Epiphany week 1); H I, 226 (Mon. Epiphany week 2); BC different); H III, 135 (Pentecost; BC different); H III, 199 = BC III, 116 (Sun. Apostles week 3); H III, 204 = BC III, 120 (Tues. Apostles week 3); H III, 700 (Exaltation of Cross; BC different). H I, 638 = BC I, 413 (Epiphany). 1 … 1 “in the type of a dove the Spirit descended and remained with Him” BC. H I, 242 = BC I, 147 (Sun. Epiphany week 4). H II, 468 = BC II, 344 (Wed. Fast week 7). 1 … 1 to Jesus the King, member of our race” BC. H II, 537 = BC II, 397 (Resurrection). H III, 667 (Transfiguration, BC different). H III, 676 (Transfiguration; BC different). H I-III, 80 of appendix = BC I-III, 74 of appendix (Qala 9). H I-III, 147 of appendix = BC I-III, 131 of appendix (Qala 16). H III, 515 (Tues. Moses week 1; om BC III, 351-352). The passage based on Isaiah 1:9 where the term “srīdā” occurs in the Peshitta, both in the Old Testament and in the verse’s quotation in Rom 9:29 (Greek σπἑρμα; the Syriac translator here, as elsewhere, deliberately adopts the phraseology of the Syriac OT). 1 I use the edition of the hudra edited by T. Darmo, Ktābā da-qdām wad-bātar wad-hudra wad-kaškōl wad-gazzā w-qālē d-‘udrānē ‘am ktābā d-mazmūrē (3 vols. ), Trichur 1960-62 (= H); the relevant passages are collected and translated in the Appendix. 2 For references, see Appendix, passages no. 1 and 2. 3 It is not clear to whom the suffix refers: it could be “the Good One “(i.e. joining the hostage to his own glory), or the hostage (i.e. for his glory, or “our mortal race” (i.e. its glory); the first is perhaps the most consonant with the East Syrian christological tradition is general. 4 P. Bedjan, Breviarium iuxta ritum syrorum orientalium id est Chaldaeorum (3 vols. ), repr. Rome 1938 (= BC). For the alteration to the first passage, see the Appendix (no. 1). 6 Num 21:29 (Hebrew pe-lēt(īm); Isaiah 18:2 (Hebrew Şīrīm); I Macc 1:10; 7:7; 9:53; 10:6-9; 11:62; 13:16. 7 Examples from Aphrahat, Ephrem, Liber Graduum, Narsai, Jacob of Serugh etc. are quoted below; some further references can be found in the standard lexica. For Aphrahat, see also A. Schall, Studient Über griedscische FremdwÖrter im Syrischen, Darmstadt 1960, 100. 8 It is present in S. Atto’s SuryaniÇe-TurkÇe SÖzluk, Enschede 1990, and in Kyrillus Jacob and Asmar Elkhoury’s The Guide: the First Literacy-Colloquial Syriac Dictionary, Stockholm 1985. For the background to these dictionaries see my “Some observations on the use of Classical Syriac in the late twentieth century”, ISSt 34 (1989) 363-375. 9 For hostages in the Late Antiquity see A. Aymard, Les otages barbares du début de l”empire, JRS 51 (1961) 136-142; D. Braund, Rome and the Friendly King, London 1984, 12-16; J. Matthews Hostages, philosophers and pilgrims, and the diffusion of ideas in the Late Roman Mediterranean and Near East, in; F.M. Clover and R.S. Humphreys (eds. ), Tradition and Innovation in Late Antiquity, Madison 1989, 29-49, esp. 37-41; A.D. Lee, The role of hostages in Roman diplomacy with Sasanian Persia, hist. 40 (1991) 366-374. From the linguistic point of view; R. Roos, Oἱ ὁμηρεύοτες. On the terminology of ancient hostages, in: S.-T. Teodorsson (ed. ), Greek and Latin Studies in Memory of C. Fabricius, SLS 54 (1990) 158-164.